Size K 6.5 mm hook, or size to achieve a relaxed stitch and flexible fabric, gauge is not important. This pattern uses a multiple of 4 + 1 stitches. Example is 30” long and 8” wide, joined with a single twist to make a moebius. Make enough chains so that when the ends are joined it will easily fit over your head. Be sure the final number is a multiple of 4 + 1. (I chained 81). Note: When working dc rows do not work into 1st stitch directly underneath turning ch. Ch 3 turning chain counts as a dc throughout. Row 1: dc in 4th chain from hook and each chain across. (If you started with 81 ch you should have 79 stitches. Be sure you have an odd number of stitches.) Turn. Check again to make sure this fits easily over your head and that it is the desired length. Row 2: ch 1, sc in first dc and each dc across ending with a sc in top of turning ch from previous row. Turn. Row 3: ch 3, dc in each sc across skipping the first sc under ch just made. Turn. Row 4: ch 4, skip one stitch, dc in next stitch, (ch 1, skip one stitch, dc in next stitch) repeat across ending with a dc in top of turning ch of previous row. Turn. Row 5: ch 3, (dc in ch 1 sp, dc in next dc) repeat across ending with a dc in ch 4 sp and a dc in 3rd ch of ch 4 of previous row. Turn. Row 6: ch 1, sc in each stitch across ending with a sc in top of turning ch of previous row. Row 7: ch 3, dc in each stitch across. Repeat rows 4-7 two more times or until desired width is reached. Weave in ends and block. Whip stitch the ends together to form a ring. Or, if you’d like a moebius, give one end a single twist and then stitch the ends together. You may make this as a straight scarf by beginning with more chains (be sure your chain is a multiple of 4 + 1). For a skinny scarf do just one repeat of rows 4-7. 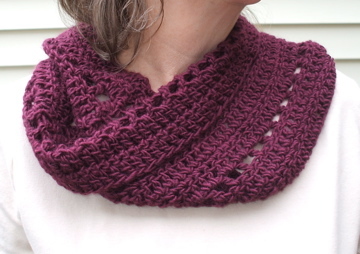 If you want this to be a wider cowl you may add an extra repeat of rows 4-7. To make a cowl that wraps around your neck twice, chain more and check to be sure the chains easily fit over your head when doubled. If you do this you’ll need extra yarn. You may substitute other weights of yarn using an appropriate sized hook. The amount of yarn needed will vary depending on the weight of the yarn used. You may use this pattern for your personal projects. Please do not teach this pattern without my permission. Feel free to link to this page and to credit me as the author of the pattern. Here are some links in case you need help with how to block your work, and how to whip stitch. This entry was posted in original pattern designs, Uncategorized and tagged beginner, cowl, crochet, easy, free pattern, instructions, worsted weight yarn. Bookmark the permalink. Bought my first alapaca fiber and looking for a simple but elegant project to get back into my handi work. I picked this! Thanks for sharing it. Making this for my BFF that lives in Chicago 😉 super cute pattern-I know she’ll love it! Tx for sharing! wonderful– a fellow Midwesterner who crochets! Nice. Will add to my collection and try this. To have your repeat of 4-7 facing the correct way, you would need a row of sc (or whatever) between them. Actually the pattern is correct as written. Of course, you can modify it to suit your preferences when you are making your project. Think I might dust off the hooks and delve into the stash for this! Thanks so much for sharing. I think I will go ahead and attempt this very cute pattern today. Threw my knitting needles across the room after starting a pattern that looks so easy, but for some reason I have started it 5 times now., and ripped it out 5 times. I’ll save that for another day.. Time to relax a bit and pick up a crochet hook. Thanks. I’m glad you enjoyed making it. I have some Serenity Chunky Weight yarn that would look really nice with this pattern but don’t know how to figure out which size hook I would use. How do you decide that? Thanks for the beautiful pattern. To determine hook size you’ll need to do a swatch. The Serenity Chunky Weight yarn calls for a 9 mm hook according to Ravelry’s database. Usually a recommended hook size is listed on the ball band of a yarn. You can make a few rows of dc with a 9 mm hook and see if you like the fabric. I used a slightly larger hook for the pattern example so you may need to go up a hook size if your fabric seems to stiff. I haven’t used that yarn so don’t have any first hand experience with it. I just made this with RedHeart’s Boutique Midnight yarn. Love the pattern. Thank you for sharing! Thank you so much for such an elegant and quick pattern. I searched everywhere for a cowl pattern after making one previously that I did not like for Christmas gifts. It was easy to alter for a size I crochet hook, and I appreciate you including the length and width of your sample. 🙂 This pattern was clear and concise. I had no issues following along. Thanks again! Thanks, I’m glad you like the pattern. I love this pattern but I’m scared of the blocking. I read up on how to block, but I’m unclear on what shape to block it in. Do I stretch it out? Make it look like a rectangle? Thanks. Blocking is easy! If it’s a natural fiber soak in a wool wash for 5-10 minutes. Rinse, get as much water out as possible. If you have an older washer you can stick it in there on spin only to get out excess water. Lay the cowl flat on a towel. Start by just smoothing it out with your hands, it should be a rectangle. Unless you want it bigger just smooth it out until it’s flat and even. If you want, measure to be sure you have the right size. You probably don’t need pins but you can use them if it’s really out of shape or if you’re trying to enlarge it. Let dry and then join. It’s not that hard. If you’re using 100% acrylic I recommend steam blocking. You don’t need to soak first for this method. Do the smoothing out as above and you’ll probably want to pin it. Use a steam iron and hold it above the cowl, NEVER touch the cowl with the iron, just wet it with the steam by hovering a few inches above the cowl. Keep your hands out of the way so you don’t burn yourself with the steam. Let dry and join. I find this type of blocking works best with acrylic yarn. Thank you! Doesn’t sound that hard. I think I’ll give it a shot! Lovely pattern. Just one query – if have 81 chains and start row into 4th chain doesn’t that then give me 78 stitches? Ch 3 counts as a stitch. So 78 plus 1, it’s been a while since Ive looked at the pattern. Of course! thanks for pointing out the the obvious! Will get going tonight. HI! I am stumped at row 5. I am not sure of where to put my dc. I am still new at reading patterns. Thanks for your help! Basically you’re making a solid row of double crochet across. After your ch 3 the first double crochet is worked into the hole made by the chain in the previous row, then the next double crochet goes in the next double crochet. You continue across like that. You end the row by making a double crochet in the last chain 4 space (into the hole made by the 4 chains) and then put a double crochet in the 3rd chain of those same 4 chains at the end of the row. Great, I’m glad you like them! I made this for my daughter in law out of a worsted weight 80/20 wool and silk blend. Stunning! Thanks for the pattern! Thanks, glad you like the pattern. Lo siento, no sé español . If you are using foundation double crochet then you just need to have an odd number of foundation stitches to make the pattern work out. Make enough foundation double crochets to give you the length you want for the scarf. Since you won’t be joining it you may want to add a row of single crochet across the edge when you’re done, or add some fringe to the scarf.